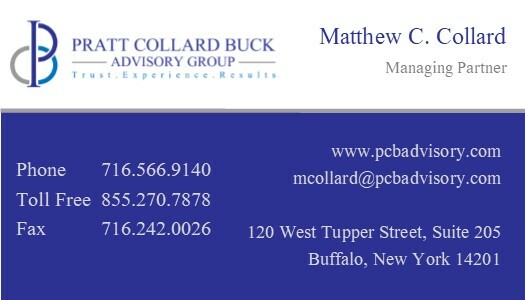 A founding partner of Pratt Collard Buck Advisory Group, Matthew is the director of the firm’s equity research group, specifically as a member of the small/micro-cap special situations team. These responsibilities often take him “on the road” visiting companies, meeting management teams, and attending various research conferences. His passion for bottom-up fundamental equity research was formulated overseas during the early part of his career with the SchmidtBank of Nuremberg Germany. This research training coupled with pursuing advanced studies at the Goethe Institute in German Business afforded Matthew an opportunity to join Harold C. Brown & Co. as a portfolio manager and member of the firm’s Research & Investment Committee. He became an equity partner in 2007 and assumed the responsibilities of Chairman of the Management Committee during the firm’s transition and subsequent dissolution. The opportunity to lead a thoughtfully independent equity research effort and more closely marry its focus with the goals and objectives of the firm’s clients, led Matthew to launch Pratt Collard Buck Advisory Group with Michael Pratt, CFA. Since November of 2014, Matthew has served as the Honorary Consul of the Federal Republic of Germany in upstate New York. Serving at the pleasure of the New York Consul General, Matthew provides diplomatic support for German Nationals living, working and traveling in the Western New York area. Matthew enjoys reading, coaching his daughter’s youth sports teams, golf, traveling and spending time with his wife, Kerry, and three daughters.